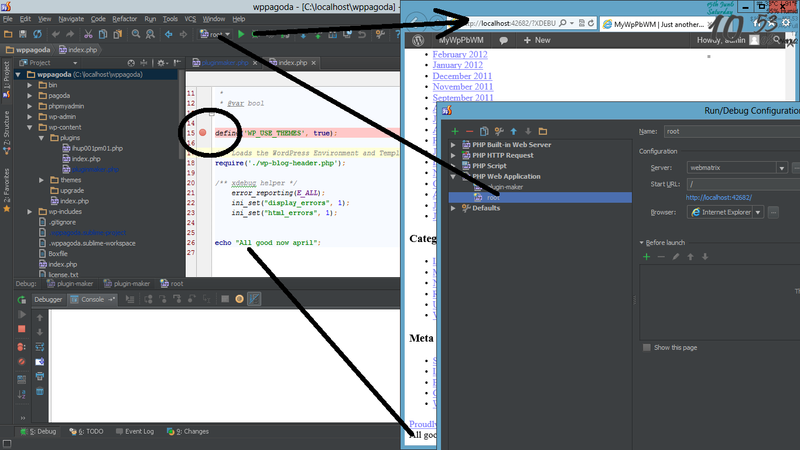 Updated question : PhpStorm | WebMatrix (IISExpress) | Xdebug.remote_port | — Which Port(s) to put where? I'm running localhost web server on my Windows machine with WebMatrix and IISExpress. I've installed PHP and Xdebug in it and they both are working. I have a local WordPress install. I'm now trying to get PhpStorm to debug it using Xdebug. When I run PhpStorm it launches the web app in the browser with relevant debugging parameters in the browser. But it seems Xdebug never gets to communicate with PhpStorm. PhpStorm keeps listening, and the execution runs completely without stopping at any break-points. Try changing the xdebug listen port in your php.ini and your IDE. Running Mac Yosemite, for me the problem was that I installed with homebrew, following a guide that used php-fpm, which uses port 9000 by default (which conflicts with the xdebug default port)... Changing my xdebug.remote_port to 9001 and changing the xdebug port in phpstorm fixed the problem, though I suspect this issue could happen for anyone in any IDE. I googled for the better part of a day and didn't see this solution (since I believe it's so specific to install method).. but I hope it helps someone. 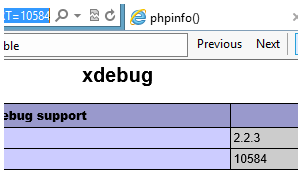 "Run" -> "Start Listening for PHP Debug Connections"
First check for on what port xdebug is working on, you can find it in your php.ini under xdebug.remote_port=9123. As you can see in my case it is set to 9123.
under Xdebug you will find Debug port, make sure that its value is the same as in the php.ini file under xdebug.remote_port (9123 in my case). 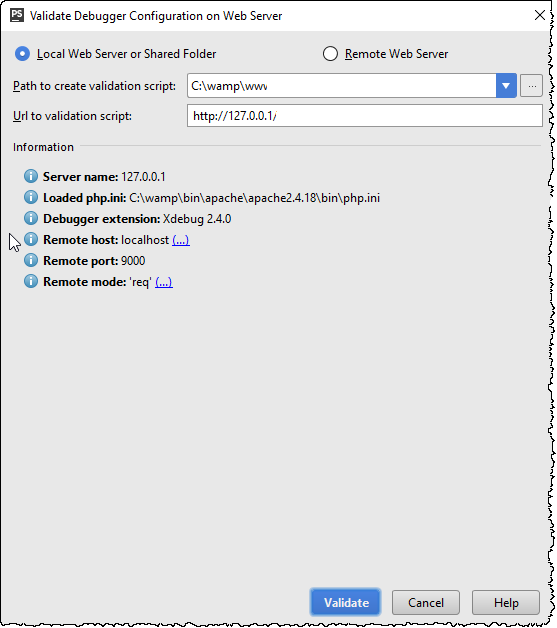 PHPStorm has a build-in tool in Run > Web Server Debug Validation. It helped me to solve my problem. That needs to be the IP address of your local machine from inside the Vagrant box, and 10.0.2.2 is the default. If you ssh into your Vagrant box, it will show the IP where you logged in from if you want to confirm. I know this isn't directly relevant to the specific setup the OP had, but this post shows up in a lot of xdebug / PhpStorm Google searches so hopefully this can help someone else. I also obtain this error message. Also was troubles with the php.ini but more subtle. Consider to look at my answer here for details "Xdebug - command is not available". There was a syntax error in php.ini. There were extra "quotes" and ;colons;. I was having this same problem while trying to test a Laravel project using XAMPP on Windows in PHPStorm. I have no idea what exactly I was doing wrong, but I did get it working eventually. 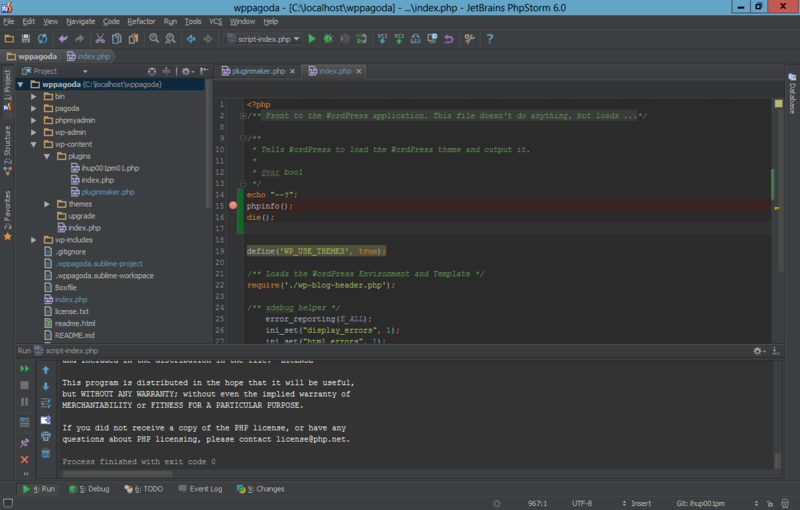 I followed the step-by-step instructions on the PHPStorm site here. 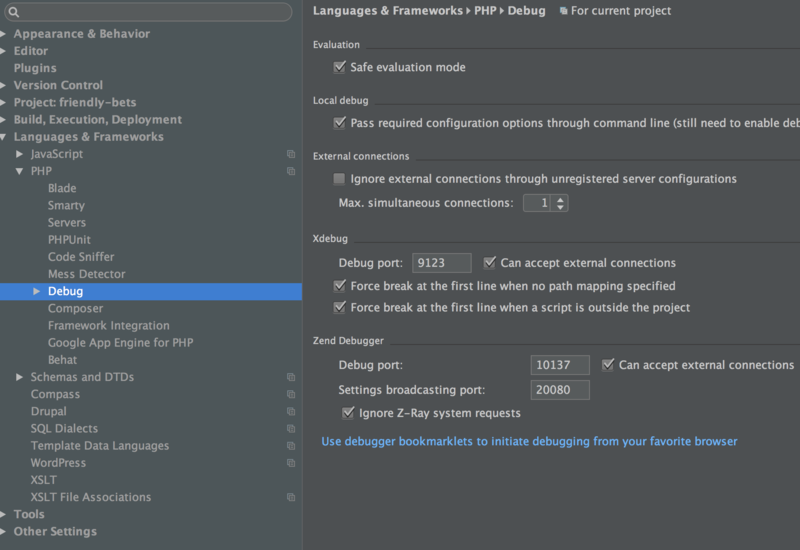 One thing I think that was not configured right was that there was no interpreter set up in the PHP menu in Settings. 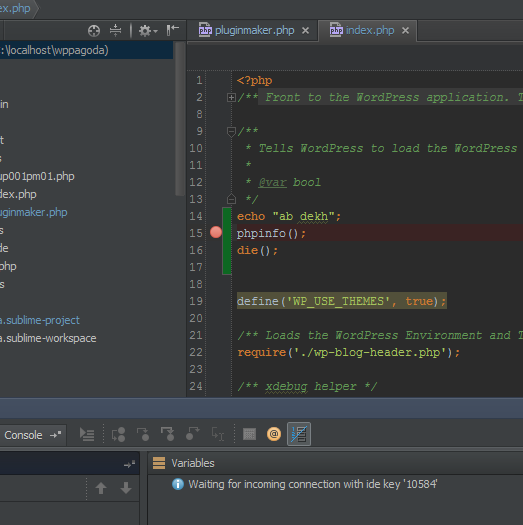 In my Run/Debug Configurations, I use a PHP Web Application setting, that just starts on the root of the site. (At first, I thought the appended ?XDEBUG_SESSION_START=<xxxxxxx> was a mistake, but it is not). Hopefully that might help if someone else is facing a similar issue. Try setting your actual ports of xdebug to 9123 instead 9000. 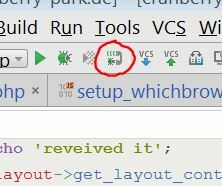 The new version (9) of PHPStorm changed its default xdebug connetion port to 9123 (the PHPSTORM config, not the actual xdebug config), probably for a good reason, since having the PHPSTORM config to the xdebug default 9000 didn't work but having them set to 9123 did work and resolved the issue. Check your firewall and proxy. Day 572... Still haven't slept or eaten... But I finally found the culprit: Windows Defender! Basically, I had a firewall blocking JetBrains IDE Support chrome extension from sending data to PhpStorm through the default 127.0.0.1:63342 address. I tried any of the suggested tricks and finally I called the script by 127.0.0.1/script.php instead of localhost/script.php and bingo! I think one of solutions if you have multiple php-fpm versions with xdebug, like php5.6-fpm, php7.1-fpm - make sure only one is running. I had both 5.6 and 7.1 running. Then tried to change on 7.1 to 9001 port. But if I change to 9001 port in PhpStorm, then 5.6 starts not working, because it listens on 9000. So each time you change php version, then probably you would need to change setting in phpStorm. So I think it is better to have only one of php-fpm running and all php-fpm versions can use same port. Not the answer you're looking for? Browse other questions tagged php xdebug phpstorm or ask your own question. PhpStorm | WebMatrix (IISExpress) | Xdebug.remote_port | — Which Port(s) to put where? PhpStorm doesn't stop on breakpoints with PhpUnit?